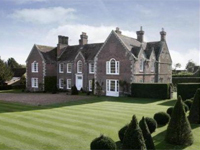 The New Year period can be a very quiet time for the sale of country houses. This can often be easily seen in the much-thinner-than-usual selection of property adverts at the front of Country Life magazine, the weekly bible of the country house. However, someone has obviously decided to steal a march on the spring rush by putting a stunning home on the market; Abbey House in Witchampton, Dorset. The Grade-II* listed property was originally built in the early 16th century and is thought to be the first brick-built house in Dorset. Formerly known as Witchampton Manor, it has 5 reception rooms, 8 bedrooms, 5 bathrooms (you might want to do something about that), plus the usual selection of outbuildings. The 6.8-acres of beautiful gardens also includes river frontage – perhaps an eco-alternative to the swimming pool. This is a jaw-droppingly lovely house and I suspect with the currently dearth of decent larger homes on the market the owners may well have timed the sale very well as the bonus money from the City looks to find a country hole to escape to. This entry was posted in for sale, News and tagged abbey house, architecture, country house, dorset, english, for sale, grade-ii, listed. Bookmark the permalink.